The sleek appearance of the Berndes 695964 SignoCast Multi-Purpose Roaster with Glass Lid is a welcome addition to any kitchen. A chef's dream is variety in the kitchen. This Berndes SignoCast Multi-Purpose Roaster can do it all. 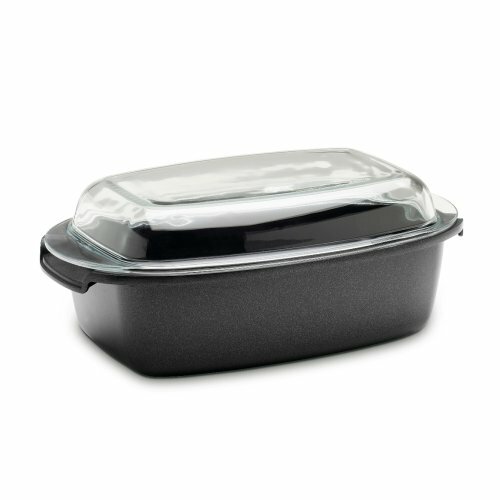 With a high domed lid that doubles as a casserole dish, and a triple layer non-stick coating for fat-free cooking. Roast, bake, broil and braise meats, root vegetables and more. Energy efficient with the Berndes CD bottom technology with safe side handles is a sure winning capability of this cooking masterpiece. With a size of 13 Inches by 8.5 Inches, this ultimate roaster is a dream come true! FAMILY FRIENDLY: No PFOA in the materials making it clearly safe. Putting the health of your family in mind as you prepare them their favorite meals! ENERGY EFFICIENT: Berndes CD bottom® is ground flat and lightly textured for optimum energy efficiency and a perfectly flat fit to the hob plate. ERGONOMICALLY DESIGNED: With dual, molded oven safe side handles, a break and heat-resistant tempered safety glass lid that doubles as casserole dish! DURABLE CONSTRUCTION: Your Berndes SignoCast Roaster is formed through vacuum casting with 6mm high-quality aluminum base thickness, made in Germany. TRIPLE LAYER DUPONT AUTOGRAPH: The Berndes 695964 SignoCast Multi-Purpose Roaster with Glass Lid is finished with a Triple layer non-stick coating. If you have any questions about this product by Berndes, contact us by completing and submitting the form below. If you are looking for a specif part number, please include it with your message.